LVD Strippit, Akron, NY, has introduced a robotic bending cell capable of robotized bending as well as stand-alone operation. 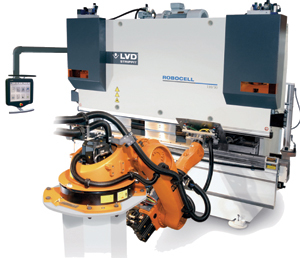 Dubbed RoboCell, the system offers mid-level automation, combining an LVD Strippit PPEB or Easy-Form CNC press brake with a multi-axis Kuka robot to handle small to medium-sized components in capacities from 80- to 110-ton bending force and 2.5- or 3-m table configurations. The cell increases machine throughput by automatically loading, forming and stacking finished parts in an unmanned process, providing high-precision parts, shorter cycle times and lower production costs, according to company officials. And all functions of the RoboCell robot and press brakes are controlled through instructions from an integrated offline programming software solution, reportedly resulting in repeatable, high-quality formed parts produced in a non-stop process. In addition to the robot and press brake, RoboCell includes hardware for all part-handling requirements during automated bending. A Cadman Touch intuitive touch-screen control system simplifies operation, with robot programs, simulation and gripper configurations calculated offline by CADMAN B—3D programming software and Kuka Sim software. RoboCell can function as a fully automated system or the press brake can be operated manually via the Cadman Touch control. The system features a full 2.0 m of space between the robot and the press brake, and the press brake is maintained at its normal working height, facilitating standalone operation.